Your wedding day may be the most important day of your life. Why trust it to a part time photographer who “does video” on the side? Allowing Uncle Charlie to capture your most cherished memories is a worse idea. Leave it to the professional who has the proper equipment, creative talent and skill to do the job well. It takes someone with many years of on-the-job training to get great shots while being unobtrusive and graceful. Professional microphones, lighting kits and filters are a big investment that most people don’t carry in their camera bag. Your full time professional videographer has all this and more to insure that your wedding day memories are preserved with class and style. Let us take away the worry, and let a professional handle your videography. You have more important things to think about on your wedding day, than being concerned if Uncle Charlie is having one drink too many, or if he’s decided to dance to his favorite songs. It was a very nice offer: to shoot your wedding video, but he just doesn’t have the experience to do your wedding justice. Let him dance the night away and have that extra drink; your professional videographer will get some amazing shots of him enjoying himself… and you’ll look a lot more relaxed too! 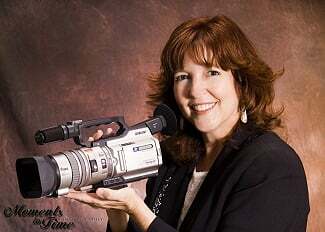 Contact Visions Unlimited at 941.315-3456 or les@beautifulvideos.com to discuss your Wedding Video with Film maker & Owner, Leslie Harris-Senac of Sarasota, Florida.